Home → → Grinder - Sharpstone Glass Top Grinder & Pollinator - 2.5"
This four piece high grade alluminum grinder from Sharpstone allows for pollen catching and storage. The clear glass top on this premium grinder provides a superior view so that you can precisely control the consistency of your herb grind. The diamond-cut teeth ensure thourough grinding of any herbal product. How does it work? Herbs are ground by the teeth in the first stage, allowing fine particles to fall through the holes onto a steel mesh screen. Then, only the finest pollen falls through the screen onto the bottom dish for the ultimate purity and potency of your herbal grinds. Also comes with a terry cloth pouch and pollen scraping tool. Perfect for use with any of our vaporizers. 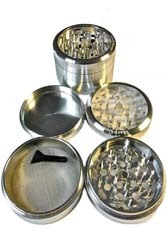 Makes a great all-purpose grinder for general herbal needs.